We have some very serious stuff coming our way. The city and neighborhood associations are planning a full out attack against landlords. They have been working with neighborhood associations for months about this plan. REI's lack of organization and not having every landlord in Roanoke as a member of our group has caused some serious problems. The City of Roanoke sent people down to Raleigh to learn about their extreme hardline force they put upon landlords. I researched Raleigh's Probationary Rental Occupancy Permit program (PROP Program) and it's very bad. If the tenants don't mow their yard, you're royally screwed. 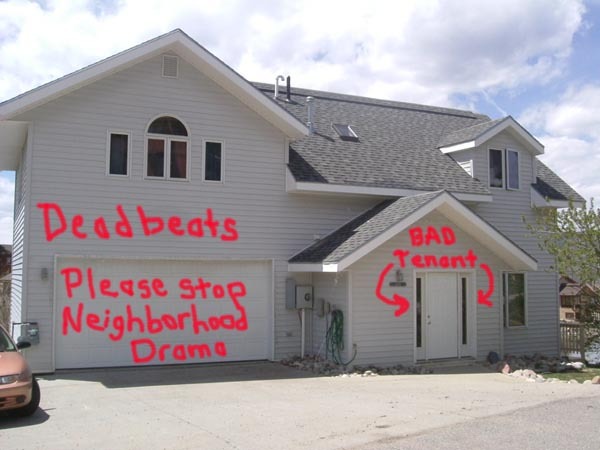 If the tenants cause disturbances to the neighbors you're screwed. If they tell you to fix something and you don't do it within the time required, you're screwed. Lets say you bought a place and are fixing it up and the code enforcer failed you on the first shot which can easily happen. Then the tenants move in and you get a violation that they didn't cut the grass. Then later you get another violation that they didn't cut the grass. And at one point in time the cops were out there for your tenants because the neighbors called. 4 violations including cop violations and your property goes on the probation PROP program. There are many ways your property instantly goes on the program. You will have 10 days to file a prop application (lol, they make you apply for the probation) If you don't apply in 10 days you are prohibited from renting the unit. This is very serious oppression! If you fail to send in the PROP application you will be fined $50 per day until the application is completed and returned. You must pay a $200 application fee to apply to be on probation even if you send it in on time. + if it's your first violation on the property you automatically get a $50 civil penalty to go along with the first $200 you will pay. Then when you get on PROP you will immediately be sent a temporary permit until the real permit is issued. Once you get the real permit you will be required to pay $300 for it for the first year and $500 for it for each year thereafter. The fee will be in addition to other code enforcement citations and fees that they will charge you. You also must get your application to get screwed notarized. Here's what happens if your tenant doesn't mow the yard or a neighbor who doesn't like them or you and calls the cops on them for some bogus reason. EACH of these warnings that you get while you are on prop will get an additional $200 administrative fee tacked on to the other fees. First violation while on PROP and you get a $50 dollar civil fee and $50 per day until the violation is resolved, plus the $200 administrative fee. On the second warning they will give you a notice that they may suspend your right to rent the unit. (as if it was a privilege to rent a house or something) This second warning comes with a $250 civil fine. And $100 per day civil penalty until the violation is in compliance. And on the 2nd violation the permit is revoked for that unit for 2 years. A third violation results in a $250 civil penalty and $250 per day until you comply to your superiors. If you are sent a letter from code enforcement saying that you are "eligible" for PROP and don't respond these fines will accrue on a daily basis. You can appeal it. You will send a letter of appeal to the director of inspections (Tom Carr or Dan Webb?) and if he doesn't approve it you can appeal a 2nd time to an arbitrator but if you lose you will be responsible for an administrative fee of $200 and half the costs of arbitration. Then you can appeal it one more time to city council (I believe in Roanoke there is a charge to do this as well) and you are not allowed to present any NEW evidence when speaking to your leaders. * If you rent out the house without first getting a certificate of compliance you're instantly on the prop program. * Reoccupying a house that the city condemned you're instantly on it. * If your tenants get a third conviction for violating the Cities nuisance party ordinance. (having a party where the cops are called by the neighbor) They don't have to be convicted of anything. Just 3 complaints. That's it. And each time you as a landlord will get sent a civil penalty by the cops. THIS IS THE PROGRAM THAT CHRIS PERKINS TOLD US HE'S GOING TO SUPPORT. I've looked high and low for this thing he said that will help landlords get tenants out and there is no Virginia bill that is being introduced like that. I'll bet that Roanoke will add something to this horrible Raleigh program to help us get them out. In an attempt to try to look like this program is fair to landlords and only "those who don't care about their property" will get screwed. I guarantee you they will position it that way! They will give a warm and fuzzy feeling to those who are easily convinced and will not disclose all of the details until they voted in city council on it and made it LAW of Roanoke City only. * If any tenant on your property has been convicted of a crime 3 times in 2yrs you get put on the PROP program. * Failure to repair, demolish or vacate the house within the granted time-frame that they require you get on it. * If more tenants move into the house than are allowed to be there you're instantly on it. Violation of zoning density. * If you have unlicensed or un-inspected vehicles or a vehicle that the tenant has partially dismantled because they are working on it you are on the probation program. * 2 nuisance abatement violations within 2 yrs and you're on it. * 4 notices of any violation within a 2 year period even if you corrected the problems or got the tenant to mow or stop causing drama or whatever. However, you still must follow all of the guidelines for Fair Housing and give the opportunity for all to live in your property. If you get put on PROP you must also attend a city approved residential property management course which you will also probably have to pay for. You must notify the tenants, condominium and townhome associations and all other effected entities (all of the neighbors?) that your house is on probation PROP. That gives the other people surrounding your house the ability to burn you good if your tenants piss them off. If the city calls you and you are within 25 miles within the city you have exactly 2 days to respond to the code enforcers questioning about your property. If you get cited even one time while on PROP you can lose your "rental permit" for 2 years and not be allowed to rent the place out. If you get a 3rd violation while on the PROP program, they will take away your right to rent all other houses you have on the PROP program. You are exempt from PROP if you are a bed and breakfast, hotel, motel, guest house, rest home, rooming house, lodging house or tourist homes. I sure hope that you guys are good at kissing code enforcements you know whats because if not you will definitely be driven out of business. You better bring cookies to the surrounding neighbors houses on a weekly basis too. Very easy to get on this program. Your tenants can even get you on it. PROP does not apply to the neighbors in the neighborhood associations. They can do as they wish. They can throw parties, they don't have to mow their yard, can get violated but their house won't get on Probation. They can get arrested, they can start fights with your tenants but the call to the police will only result in you getting fined, not the neighbor. It ONLY applies to landlords, not neighbors or tenants. Just you the landlord. Interesting backwards logic right out of Raleigh's play book. Q: Why aren't tenants held responsible? A: Ultimately, the condition of the rental property and the activities of the tenants must be closely monitored by the property owner. Property owners are expected to write clear expectations of tenant behavior relative to neighbors into leases, and take action to encourage tenants to comply with these expectations or seek evictions for problem tenants. Rental property owners can also attend the City's Landlord Training Class given three times a year for more useful information about renting and protecting rental property. The pieces of the puzzle have now been put together and are in place. We need to ban together and break it before it's too late. Fight for your rights or you will no longer have any! One attack after another on the "evil rich landlord" and we have to work together to stop it.